Construction workers are some of the hardest working men and women in our country. They literally have built our homes, our cities and our country into what it is today. Sadly these are some of the most frequently injured workers in our entire workforce. Because of the naturally dangerous tasks they are performing, the environments in which they work, and the conditions that they must work in, it is not at all uncommon for construction workers to be seriously injured or killed in their line of work. When an accident puts a construction worker out of work or causes them permanent damage to their body, they can turn to experienced workers’ compensation attorneys such as the Certified Workers’ Compensation Specialists at the Law Offices of Michael J. O’Connor & Associates. We never charge anything out of pocket for a consultation and case review to let you know how we can help you in your case. Call us at 1-800-518-4529 or fill out our contact form to the right for a free case review by one of our experienced workers’ compensation attorneys. About one out of every five worker deaths per year in the U.S. are construction workers. In 2013 for example, out of the 3,929 workers who died because of a work accident 796 of them were construction workers. There are four leading causes of these deaths, known as the Fatal Four; falling, being stuck by an object, being electrocuted, and being caught in between objects. All of these injuries can be severe enough that the worker can be out of work for a long time, or even permanently. If your injury has caused you to miss a long period of work, or if you will never be able to work again, you should contact a workers’ compensation attorney to see what your rights are. Your company can be one of the best companies to work for but their insurance company is still not your friend. They will most likely try to handle your case as cheaply as possible which can leave you stuck paying the bill. Nearly one of every twenty construction workers have been in a work place injury. Most of these injuries are due to defective equipment, mistakes being made while handling equipment, unsafe conditions, scaffolding or structural collapse, lack of guards and falls, electrical faults, explosions and chemical leaks. Besides the workers’ compensation claim an injured construction worker can file, a third-party claim can often be filed if the accident had something to do with equipment or structures that were made by another company. This is most often seen if equipment malfunctioned leading to the worker’s injury. You need to report your injury within a certain amount of time. Your boss needs to know as soon as possible if you were injured. You should then fill out a claim form and submit it to your employer. Do not quit your job. No matter what, if you are being treated unfairly, if your employer encourages you to quit, if you can no longer do the work, do not quit your job. You lose your ability to receive workers’ compensation if you quit your job. 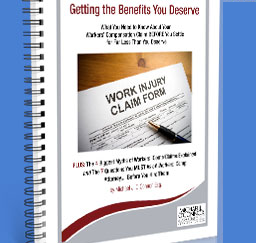 You should speak to an experienced workers’ compensation attorney as soon as possible. Fill out our contact form or call us at 1-800-518-4529 for a free, no obligation case review to see how we can help you. You do not need to go this alone, and you will never have to pay out of pocket for our representation.